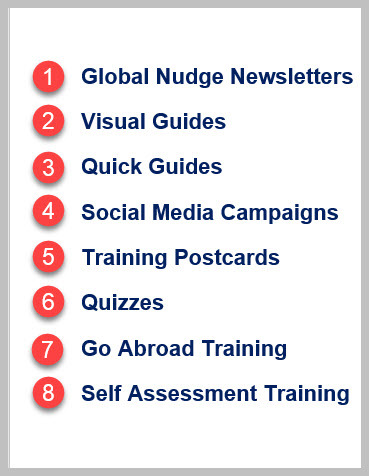 EDITOR'S NOTE: Ask us how MyWorldAbroad can help you meet your training objectives. We help your identify where and how our training products can fit into your current programs. 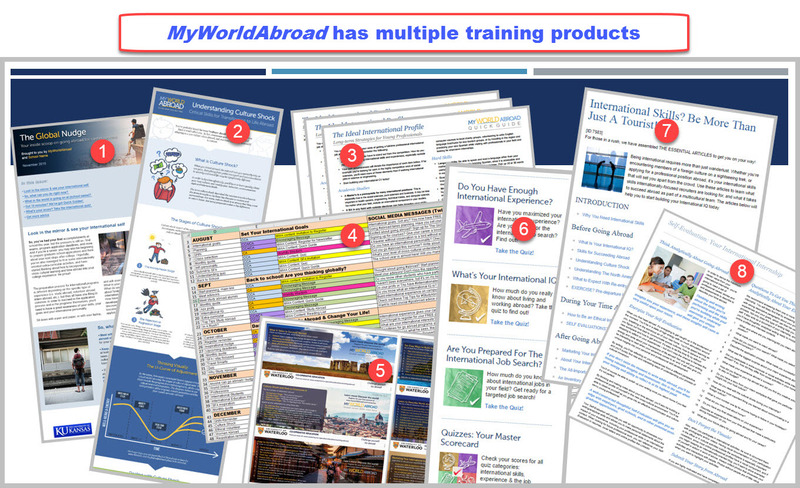 MyWorldAbroad is designed with training in mind! Schools that integrate our training products into their go-abroad programming have much better student usage stats and derive maximum benefit from our service. Below is a list of some of our most popular training products. full credit courses: a few schools have designed credit-based courses entirely around our Web site. Staff Training Webinar: Consider attending our webinar: Integrating MyWorldAbroad into Student Training Programs (view). The Global Nudge Postcard Series is a set of vibrant TRAINING postcards that features bite-sized pieces of key advice to get your students thinking about going abroad and building international career skills. Print and share up to 12 of these attractive and informative cards. View samples: page-1, page-2, page-3, page-4. See all the details here. "In A Rush?" Articles: These are our selected top articles from each section: International Skills, Getting Experience, Finding Work and The Professions (view). Self-Evaluation Questions (view) and Stories from Abroad (view): Our self-evaluation forms are customized for each type of go abroad experience. They are centred around thought-provoking questions that have been designed to help students think analytically before, during and after going abroad. Meanwhile, our popular collection of Stories from Abroad adds a first-person, peer-to-peer learning element to the site. Pre-departure Ideas Checklist (view) is a set of questions designed to helps students mentally prepared for their upcoming adventure abroad, and to help students make the most of their travels in terns of professional skill building and networking. Sample Application Documents are written by students, and they highlight the fact that there are many different approaches to developing successful application materials for programs abroad (view). Sample Resumes from MyWorldAbroad showcase resumes that consitently apply the principles of our career-building advice (view). PRE-RECORDED VIDEO: Mini-Introduction to MyWorldAbroad: 19-minute pre-recorded video designed especially for student interns and advisors from career and study abroad offices. 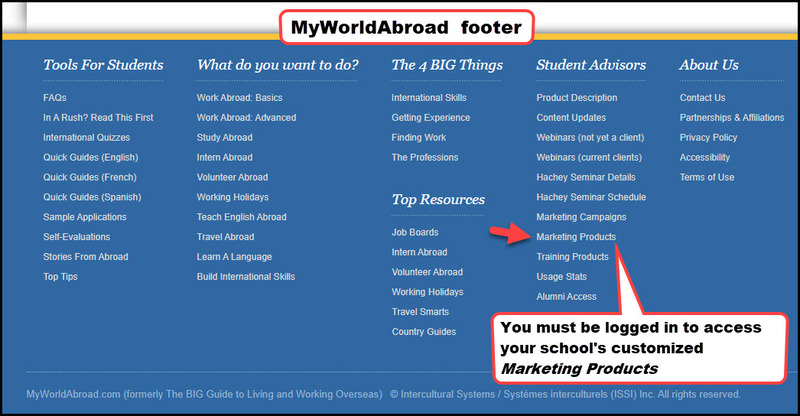 This is the fastest way to learn about the MyWorldAbroad Web site. The first five minutes cover the essentials of the site, and how you can help students use MyWorldAbroad. The following 14 minutes cover our overall philosophy and provide advice on how to help more senior or advanced students understand the international job search. View the 19-minute video now.